This Glider and Ottoman set from Naomi Home lets you sit back and have a relaxed time with your baby. The sleigh glider rocker chair with ottoman is crafted in a fine manner. High quality hardwoods are used in the construction of this glider chair with ottoman. It has a ball bearing mechanism encased in steel. 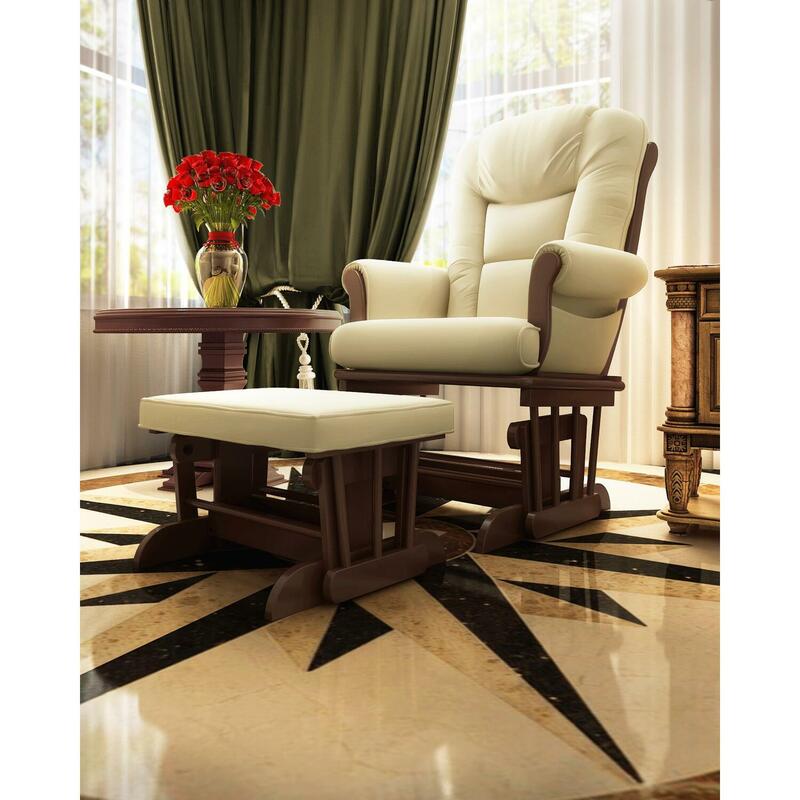 This mechanism ensures that this glider rocking chair with ottoman has a smooth and quiet gliding motion. The oversized seating area of this upholstered glider rocking chair has thick paddings. The back and arms of this glider chair and ottoman are adorned by fiber fabric cushions. It is very easy to find the perfect position while using the glider nursery rocking chair since it can be conveniently adjusted and locked in many different positions. This ottoman chair is perfectly suitable for the nursery. If you want a relaxing place to bond with your little baby, then you need to get this Naomi Home chair ottoman set since it is the best in its class available for sale. This glider rocking chair offers enough support for your neck and back since the chair has an extra tall back and arms. The cushions of this espresso glider with ottoman set offers comfort during the rocking sessions with your baby. 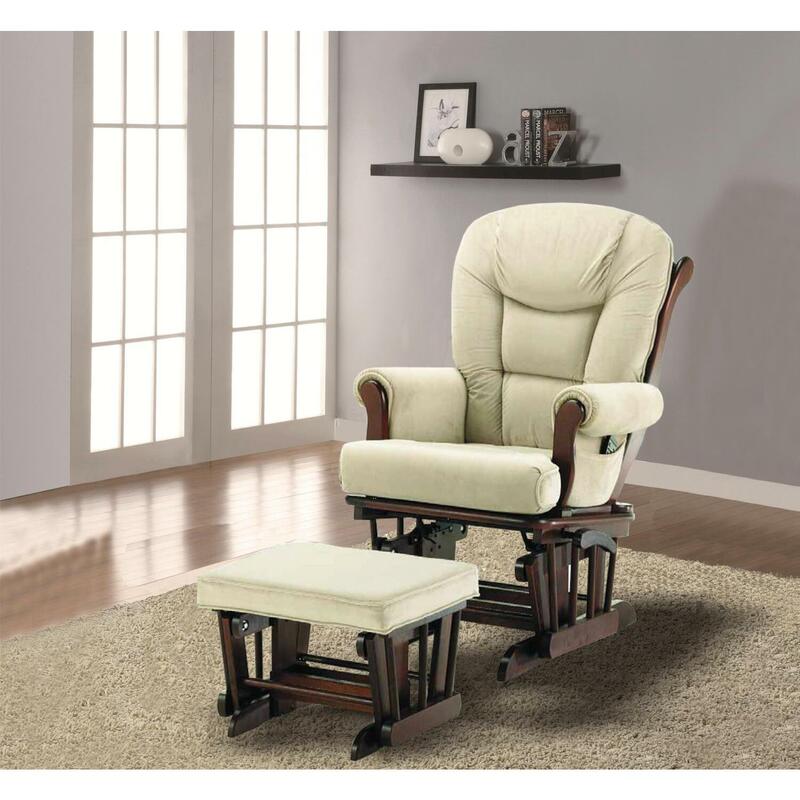 This glider rocking chair provides plenty of support and comfort for all your nursery needs. You do not have to wonder about where to buy a nursery glider chair and ottoman set because it is available for sale for the best price at OJCommerce with 10% discount. When you are looking to buy the best full body pillow for pregnant women, it seems as though there are plenty of options. But, finding the best body pillow for pregnant moms can be quite challenging. Are you tired of stacking multiple pillows just for some comfort Well, you need to stop doing that! Naomi Home Cozy Body Pillow has plenty of glowing reviews. It is a great solution to provide relief for pregnant ladies. Our Pillow has plenty of High Quality Fill for continued comfort unlike other pillows. Who want's a pillow to go flat This full body pregnancy pillow has sturdy construction, smooth seams, & ergonomic support to help position the body of pregnant moms for relaxation & firmness. This whole body pillow helps pregnant women cuddle up before & after pregnancy. This full length body pillow for pregnant ladies is designed perfectly for sleeping or leaning in a number of different positions to provide support to the head, neck and legs. Pregnant moms can sit & feed with proper back support with this full body maternity pillow. It is very useful for nursing. Any pregnant mom will feel snuggled yet free & cool enough with this full body support pillow to fall asleep faster and easier than ever before. Nothing is more important than making sure that pregnant ladies rest properly. Naomi Home has listened to the concerns of pregnant moms. A major challenge in looking for a good total body pillow for pregnancy has been finding a pillow which has no hard edges. These edges can cause a lot of discomfort & dig into a pregnant mom's shoulder. This comfort body pillow features a gusseted neck & shoulder area which offers a soft and smooth transition from pillow to mattress that contours to the shoulder & helps a pregnant woman sleep in a restful manner. This body length pillow has lumbar support of added weight and belly support while a pregnant mom sleeps. A wedged belly support present in this best rated body pillow hugs the tummy which in turn helps rest the baby comfortably. Moreover, other pregnancy and maternity body pillows have a flimsy, oddly shaped head area, but this Naomi home cozy body pillow comes with a large, square shaped head rest area. The head support of this prenatal body pillow mimics the look and feel of standard pillows to overcome muscle memory. You do not have to spend a lot of time getting used to the shape of this body pillow during pregnancy & you can spend more time in a state of cozy relaxed full body comfort. This is the most comfortable body pillow which has an easy to remove zipper-cover. This means that you can wash the pillow & case separately. Hence, maintenance is very easy. This good body pillow is machine washable. This best rated pregnancy body pillow is made of 100% cotton with 300 Thread count percale. With OJCommerce, you do not have to wonder where to buy body pillow for pregnancy. Naomi Home cozy body pillow is available for the best price at OJCommerce with 10% discount if you use the coupon code NH10. Due to hygiene reasons, you cannot return this maternity body pillow. Recently, we purchased the Naomi Deluxe Multiposition Sleigh Glider and Ottoman set on line. We give 5***** to this outstanding product and to the shipping company for their prompt delivery.of this outstanding set. It is exactly as described: well constructed with solid wood and smooth gliding/rocking metal mechanism. The assembly instructions were easy to follow. The soft upholstery is of high quality fabric and will clean easily. The deep, padded seat and back cushions make this chair extremely comfortable. If you want a relaxing, and comfortable chair, this is an excellent choice. The entire purchasing experience of this quality product could not have been better. Great chair for the price. Cushioning was a bit less plush than it looks. It rocks great and feels comfortable enough with a pillow behind. Was easy to put together. This chair is very nice and the footstool looks small, with good quality. It got better cushions, was shipped promptly with one large box packed very well. No damage. Took about 30 minutes to put it all together.